Yeah, that actually sounds good. Except, I think Thom is planning on making some items available in other ways than anomalies. Found what might be the bug Thom originally mentioned. After playing with the TSN RP Community, there was an issue that I believe was caused by wrecks being created when ships are destroyed. I am not sure, but perhaps a wreck that is created which is then infested with piranhas is the problem? The error message included a point about "space monster" error. Perhaps, when the wreck is spawned, if it is a "piranha wreck" they try to spawn instantly in the same place, and therefore cause the crash. From experience mission scripting and GMing, spawning stuff like generic meshes in the same place causes a similar crash to occur. Hope this helps (and hasn't been picked up already)... will forward direct to Thom too. Spawning wrecks crates a spacemonster that is then swaped for a wreck and moved to the correct location. During this sim there where several engagements going on at the same time, did two monsters spawn? Other errors noted: Pausing the simulation does NOT pause the upgrade count down timers. Also the "re joining mid mission" issue is still present. Destroying what ships make wrecks? I actually think enemy ships becoming wrecks is a super cool idea. These enemy wrecks when destroyed give upgrades? Means it's almost impossible to keep upgrades out of dcripted mission with Kraliens in. I'm gonna assume these "fresh" wrecks don't have space monster surprises because that'd make no sense. This again seems to be by chance. More often than not, no upgrade is given it seems. Yes, but when it is dropped, (and an anomaly is dropped) the anomaly is a random type. The bug certainly seems to be related to x coordinate, and I have seen it quite a few times myself. The monster in the upper right corner of the map in Fish Evans' post certainly seems to be a smoking gun. How about this: When a "monster" is unscanned, it appears as a large grey dot, similar to how an unscanned enemy ship appears as a grey triangle. If the scan reveals that the object is a wreck, then it continues to appear as a grey dot, with the word "WRECK" to distinguish it. If the object is a monster, then the grey dot is replaced with the typical monster icon, distinguishing it as a monster. There should be no problem with using a grey dot icon, dot icons in various colors are already used on the LRS. So it's an already available graphic. Maybe in later releases of the game, the monster icon could be changed to an actual silhouette of the monster, the same as with enemy ships. The "monster color" can continue to be light lavender, so there is no mistaking them for ships. If in the future other non-organic objects are added to the "monster" list, they can remain as grey dots, like the wreck does, or become a whole new icon. A "wreck" icon might be nice for consistency, but I think the grey dot will be fine, and will make the wreck stand out in a crowd of enemies and monsters. If a second scan will reveal the health and strength of the life readings of a monster, maybe a second scan of a Wreck can reveal if there is an anomaly inside -- or even if it will summon piranha. I have done some more testing. I decided to create a script to create a Double Agent upgrade anomaly, and play around with setting the surrender chance of enemies to various levels and see what effect it has. This is in follow-up to Arrew's concerns about the auto-surrender feature effecting a mission. What I found was the Double Agent upgrade DOES NOT APPEAR TO WORK in scripts. When I activated the upgrade and told an enemy to surrender, nothing happened. The enemy did not surrender, and Comms did not receive a message that the double agent had taken over the ship. I am assuming this is a bug. I would recommend that if Thom fixes the bug, that he makes it so that the enemy will surrender only if it does not have a surrenderChance of 0. That way script writers can manually set the surrenderChance to zero for any enemy that they don't want the Double Agent to work on. I also found that enemy ships normally have their surrenderChance set to 50, which presumably means they have a 50% chance to surrender under ideal conditions. If the Intel part of the Science scan says that the captain is "brave", the surrenderChance is 0. (So brave captains would be immune to Double Agent if Thom implements this) If the captain is "cowardly" the surrenderChance is 100. If Thom doesn't want brave captains to be immune to Double Agent, he could set the surrenderChance to 1 for those ships instead. But I kind of like the idea that there are ships that might be immune to Double Agent, and Science can find out if they are. EDIT: A second test resulted in Double Agent working in one case. I actually have no idea why it worked, although it was on a new enemy that I had created from the GM screen after activating the upgrade. I'll note also that even when I set surrenderChance to 100, I could not get an enemy to surrender in the Module_3_bases script. I am not sure this is a sign of a bug that is present in all mission scripts. OK, definitely think we have pinned the bug down to the piranhas. We played again just now and crashed when we were engaging a small swarm of them. One ship was drawing their attention whilst the other picked them off. When they turned to engage the second ship, all 25 people playing crashed. To stop this happening, we have had to reduce monsters to "none" on the server settings and ensure no one targeted and destroyed the wrecks, so as to avoid spawning any piranhas. It is a shame, because I was quite enjoying watching the piranhas explode into puffs of smoke. And I do like clearing out the wrecks after a combat to see what goodies are floating around in them. It would be really great if this gets fixed soon. Have you replicated it in a single-ship game? We encountered the bug during a party, but all the bridges were running solo (I think). Did that particular swarm exist at the start? or did they spawn from a wreck? Was there a particular exchange of fire like a nuke or anything? Was it right after they changed targets, or did they chase for a minute? For me, Double Agent doesn't seem to work across long distances. Perhaps there is a max range. It seems to have always worked when the enemy was close, i.e. visible on the weapons or helm consoles. Hm. That could be it. I'll try my tests again. Hmm... how unstable a release is this one? I am hosting a game tomorrow night, considering whether to update for the cool new stuff or hold out. I mean, if the game is going to crash maybe once in the night, that's fine; but each session is a bit much. What's the frequency of crashes you are seeing? Keep a back up and have both on hand? This was on a co-op game, though I cannot say for certain if we were running co-op mode or solo mode. I think we may have been running solo mode with multiple bridges in game. The swarm did not exist at the beginning of the game. They spawned from a wreck. All monsters were switched to "None" in the game settings in order to remove them and avoid any potential problems. It seems though that they still spawn from wrecks even though this may be the case. I believe we first destroyed the Kralien ship, and then due to the proximity of a player ship to one of the wrecks, it immediately spawned piranhas. At the time, two ships were engaging a Kralien enemy fleet. It was a light fleet, made up mainly of cruisers and battleships. Nothing heavy was in the fleet (i.e. torgoth). We had just finished destroying the fleet, when the piranhas spawned. They turned attacked our supporting ship, so we started shooting them to clear them out. I was quite enjoying the way they exploded into a blue gas. They switched to target our ship, and within moments the game crashed. The only weapons firing were primary beams. 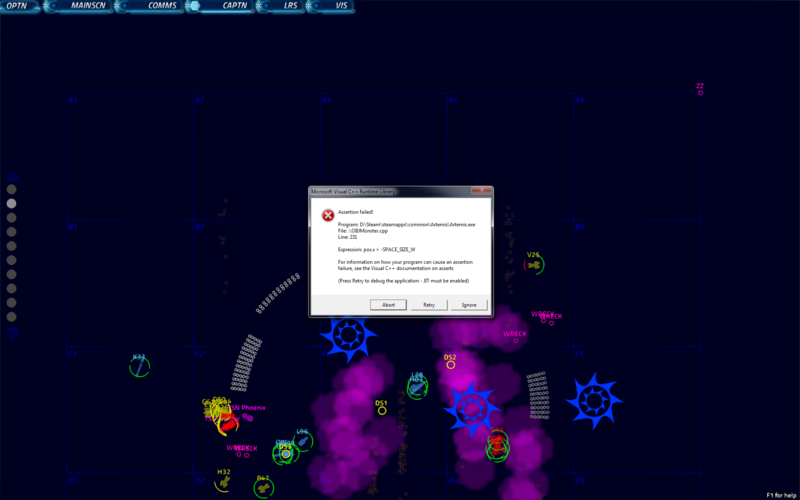 It seemed that they switched target, moved towards us and as we fired the server crashed. Hope this is a help and it can get fixed. We had already decided on not destroying wrecks to reduce the risks of a crash, but if piranhas spawn automatically from wrecks and it causes a crash, it is virtually unavoidable. It really makes playing a hit or miss, particularly on GM controlled missions where a mission can completely go down the drain if the server crashes.